This 16-year-old girl’s memory is an all too familiar one for Laurie Schaffner. 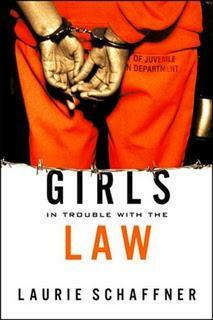 Her multi-year, qualitative study of girls involved in the juvenile corrections system, Girls in Trouble with the Law, quickly revealed that virtually all of the girls interviewed had witnessed or experienced some form of violence, abuse, or neglect—trauma that can be directly linked to girls’ later lawbreaking, Schaffner argues. Employing a self-described “feminist sociology,” Schaffner seeks to give voice to a largely-invisible population of detained girls, interspersing their accounts of the abuse in their lives and experiences within the legal system with vastly informative analysis on the various processes at work in these girls’ lives. Schaffner’s interviewees, like all American girls and women, were affected by a hyper-sexualized, consumerist culture thriving on the eroticization of young women. Often living in “empty families” where abuse and neglect were commonplace, the girls also dealt variously with poverty, racism, sexism, homophobia and a lack of quality education and emotional support. The immense amount of sadness in these girls’ lives was overwhelming. They had no time, energy or resources for grieving after they had been raped, witnessed the beating of a mother or lost custody of their child. Many of them had much-older boyfriends, were forced to parent their own parents, experienced sexual harassment at school and in their communities and echoed a culturally-constructed attitude of misogyny toward other girls. What at first glance seemed to be a dense, academic work was actually very readable, incorporating detained girls’ artwork and poetry with Schaffner’s convincing arguments on behalf of troubled young women. Schaffner’s work is honest and focused, and immensely enlightening to those who are not daily faced with the same struggles as these girls on the margins. I've read this book and really loved it. it was deeply moving, very informative and highly relevant to the current moment.